The Oregon economy is nearing full employment, a milestone not seen since 2000. According to our office’s Total Employment Gap, the one remaining part that is not fully healed is the participation gap. This measures the difference between the actual labor force participation rate — the share of adults with a job or looking for work — with a demographically-adjusted version to take into account the aging Baby Boomers. The underlying question is how much slack is left in the economy? The reason being is that once the slack is gone, one can expect the economy to begin to transition to a more sustainable rate of growth in the future. A large body of evidence has linked joblessness to worse economic prospects in the future, lower overall well-being and happiness, and higher mortality, as well as negative consequences for families and communities. To help our office better understand these changes, what follows is an abridged version of the CEA report using Oregon data. First, there have been considerably different outcomes among various subgroups within the prime working age population. One key aspect is educational attainment. Those with a college degree have not seen their employment or participation rates decline nearly as much as those with less formal schooling. Oregon’s patterns look nearly identical to the nation overall. Next the CEA tries to understand what is driving these trends by analyzing supply side and demand side issues in addition to broader institutional changes. Their results show that while supply issues are real, they alone cannot explain the timing nor the magnitude of the LFPR declines. Demand side issues fit the data better. 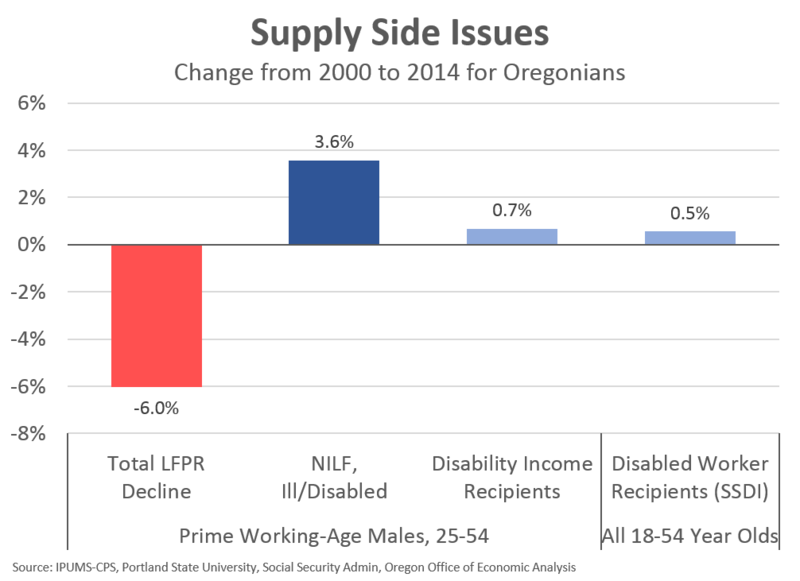 On the supply side, participation among prime working age Oregon males is down 6 percentage points since 2000. This is a big drop. There has been a large increase in those claiming they are not looking for work due to being ill or disabled. This increase accounts for 60% of the participation rate change overall, on net. However, what is interesting to note is that this increase has not been accompanied by a corresponding increase in those actually receiving disability payments. There is a big disconnect here that may be a little hard to reconcile. However the data makes clear that the increases in those claiming disability as the reason for not working is many times larger than the actual increase in those in disability programs. To the extent that these individuals are permanently gone from the economy, it does not necessarily matter if what they claim and what they do are different. A smaller labor force results in slower economic growth moving forward, everything else equal. What the CEA does find is that demand side issues fit the LFPR declines better overall. This means that the fewer job opportunities for prime working age males, particularly those with less schooling, leads to lower participation rates. This is both good and bad news. A stronger economy that creates more jobs will employ more people. However to the extent that the skill sets of those out of the labor force today do not match the demands of the new jobs, a stronger economy alone cannot help these trends. 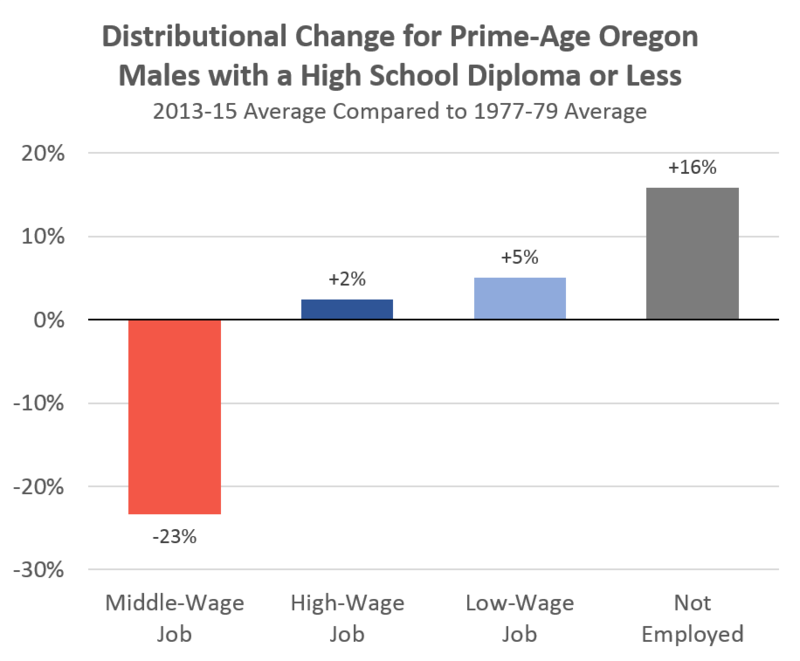 Among Oregonians with a high school diploma or less, middle-wage jobs have declined in recent decades. This is true both as a share of the economy and in the outright number of such jobs. Of course we have known about job polarization and its impact on the Oregon economy for some time now. However, the losses of blue collar jobs is particularly pronounced among this demographic group. While some have found work in either high- or low-wage occupations, the vast majority of this adjustment has been to drop out of the labor force entirely. Part and parcel with these trends is the flat to declining wages for those with a high school diploma or less. 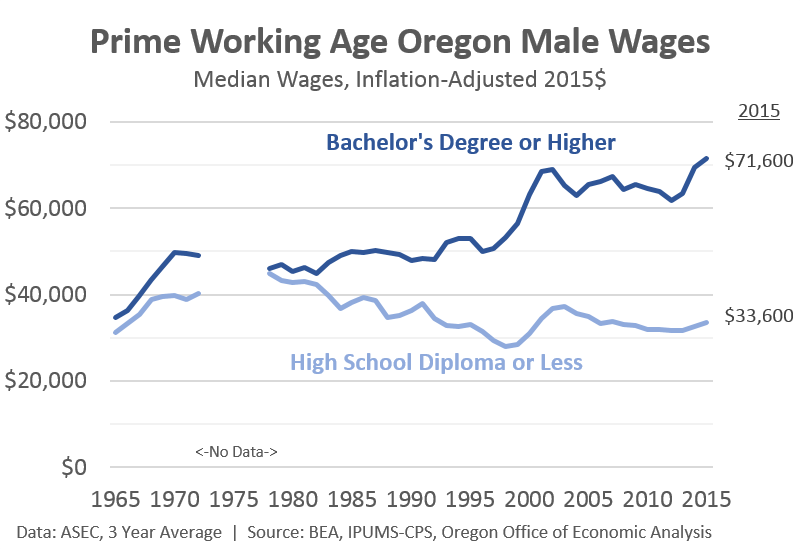 Two generations ago, wages were somewhat similar across the educational attainment spectrum, both nationally and in Oregon. This widening gap is due to both wage gains for college-educated workers and also wage declines for those with a high school diploma or less. Additionally, the CEA report found that states with higher wages for those in the lower part of the income distribution saw higher LFPR overall. The falling participation rate is a discouraging economic trend, particularly among the prime working age population. In recent years our office has researched various portions of the LFPR decline, including the increase of stay-at-home parents, and to what extent the declines are more likely to be cyclical vs structural. This last part is the most important for our office and the outlook both in trying to time the transition to more sustainable rates of growth and also the size of the potential labor force and economy in the future. For businesses, we know that as the economy gets closer to full employment, finding quality workers is certainly more challenging. Businesses must cast a wider net and also pay higher wages to attract and retain the best workers. This is happening today, in Oregon in particular where our LFPR is rising quickly and wage growth outpaces the typical state. Of course there is still room for further improvements too. The CEA report itself explore more in-depth the impact of spousal income, public sector benefits, poverty rates, international comparisons and flexible labor market policies. The report ends with a section on policies to try and boost participation, for those interested. 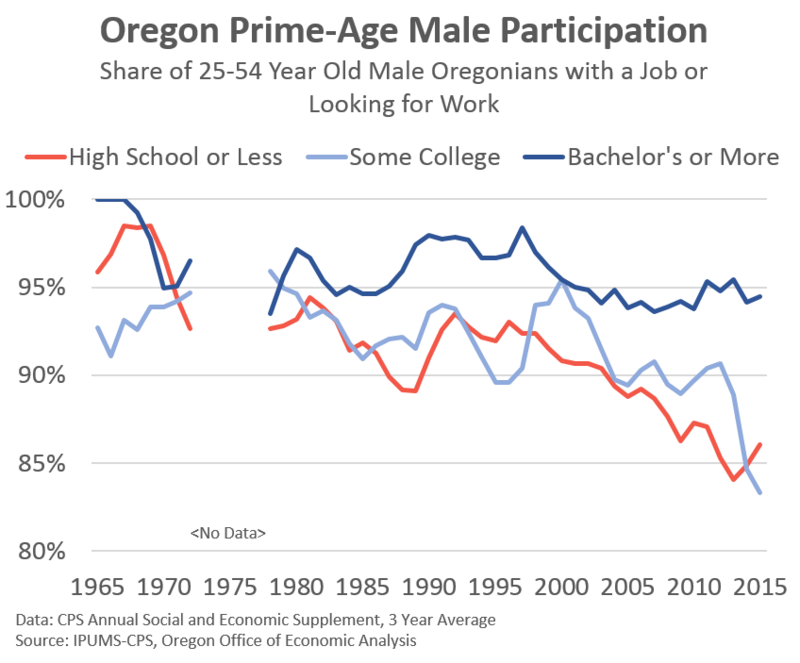 Looking at graph for Oregon Prime Age participation, it appears that males with some college are actually doing worse than males with BA or just high school. Why is that–or am I misreading the figures? Would like to see a graph like this for females as well. Thanks Kassie. You are not misreading the figures; that is what it shows. Given underlying sample size issues, I would not make too much about the specific year to year comparisons. However I think it is fair to say that labor force participation rates for those with some college and those with a high school diploma or less are similar and seen similar trends over time. Also, working on female versions now. More to come this week and next.